The Supreme Court of Canada building was designed by Ernest Cormier, a renowned Montréal architect who also designed the Quebec Court of Appeal building in Montréal, the Government Printing Bureau in Gatineau and the central building of the University of Montréal. 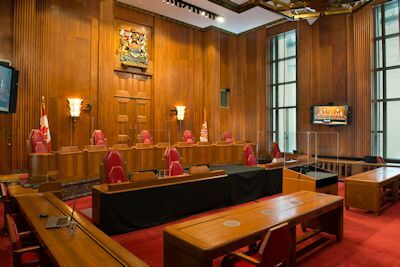 Situated just west of the Parliament Buildings on a bluff high above the Ottawa River, and set back from busy Wellington Street by an expanse of lawn, the building provides a dignified setting worthy of the country’s highest tribunal. 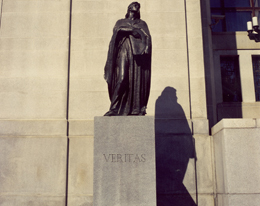 A statue of former Prime Minister Louis S. St-Laurent (1949-57), erected in 1976, stands on the lawn in front of the building. It is the work of Vancouver sculptor Elek Imredy. There are two flagstaffs at the front of the building. The one to the west is hoisted daily. The other flag flies only when the Court is sitting. 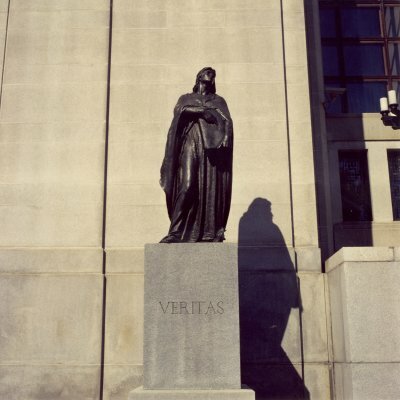 Two tall statues have been erected next to the steps of the building: Veritas (Truth) to the west, and Ivstitia (Justice) to the east. 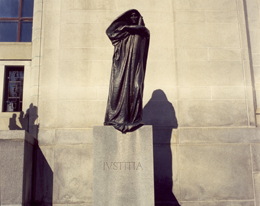 They were sculpted by Toronto artist Walter S. Allward, the creator and architect of the Canadian National Vimy Memorial in France, amongst many other works. A bust of Mr. Allward, bust of Mr. Allward, created by artist Christian Corbet, is found in the Grand Entrance Hall. At the entrance to the building are two candelabrum - style fluted metal lamp standards. 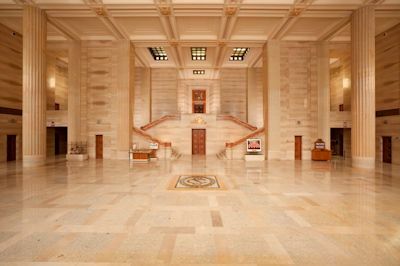 Two bronze doors give access to the impressive Grand Entrance Hall, which measures 32 metres by 17, and is 12 metres high. The walls are made of rubané marble and the floor of rubané and Montanello marble. Four Verdello marble columns along the end walls support a deep coffered ceiling. In the Grand Entrance Hall is the bust of Sir Lyman Poore Duff, who was Chief Justice from 1933 to 1944 and is the Court’s longest-serving member to date, having served from 1906 to 1944. The busts of Chief Justices Cartwright, Laskin, Dickson and Lamer, by sculptor Kenneth Jarvis, Q.C., can also be found in the Hall. 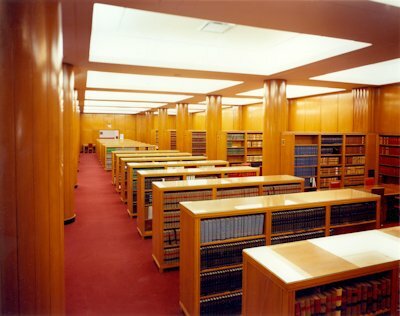 Photographs of all the judges who have sat on the Supreme Court since its establishment hang in the Gallery of the Hall. 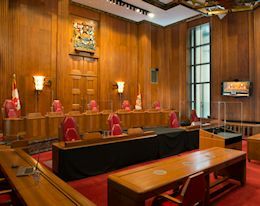 At each end of the Grand Entrance Hall is a courtroom, one used by the Federal Court of Appeal and the other by the Federal Court. 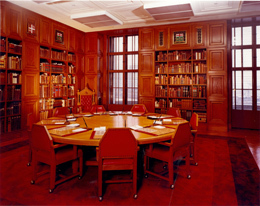 The walls of these two courtrooms are panelled with Australian Blackwood, punctuated with zebrawood pilasters trimmed with Honduras mahogany. Corridors with Missisquoi marble floors and walls encircle the building on the ground floor as well as on the first and second floors. 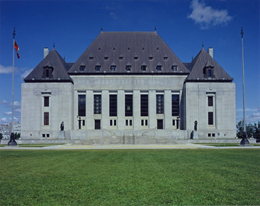 The Main Courtroom, reserved for the sole use of the Supreme Court, occupies the centre of the building on the first floor. 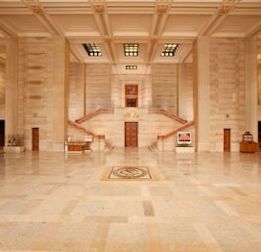 Two stairways leading up from the Grand Entrance Hall provide public access to the Main Courtroom. 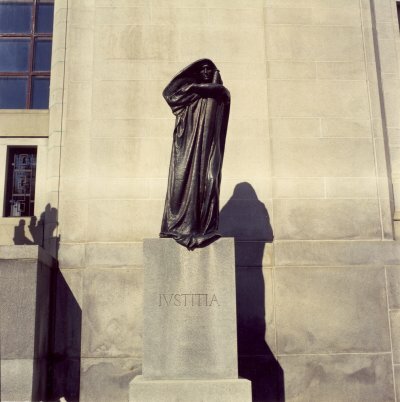 A bronze reproduction of the original Supreme Court of Canada building, a gift from the Canadian Bar Association for the Court’s centennial year in 1975, hangs between these stairways. It is the work of Canadian artist Arthur Price. Verdello marble was used for the staircase and golden Morocco marble for the railings. The Main Courtroom, which measures 12 metres by 16, has black walnut walls between fluted pilasters. Six tall windows open to the naturally lighted interior courtyards, which also serve as buffers to protect from outside noise. The groundwork for a modern courtroom was laid in 2007 with the installation of new computerized audio-visual equipment and a wheelchair accessible lectern, as well as wireless Internet connections. Display monitors for counsel and the media were added, and laptop computers were embedded in the bench desktop for the judges’ use. The new lectern can be raised and lowered to accommodate counsel of different heights and those in wheelchairs. In addition, new cameras were installed along with an improved lighting system. The Court Registry and the offices of the Registrar and the Deputy Registrar are also located on the first floor. The Judges’ Conference Room is directly behind the courtroom. The main reading room of the Court’s Library is on the third floor of the building, directly above the Grand Entrance Hall.